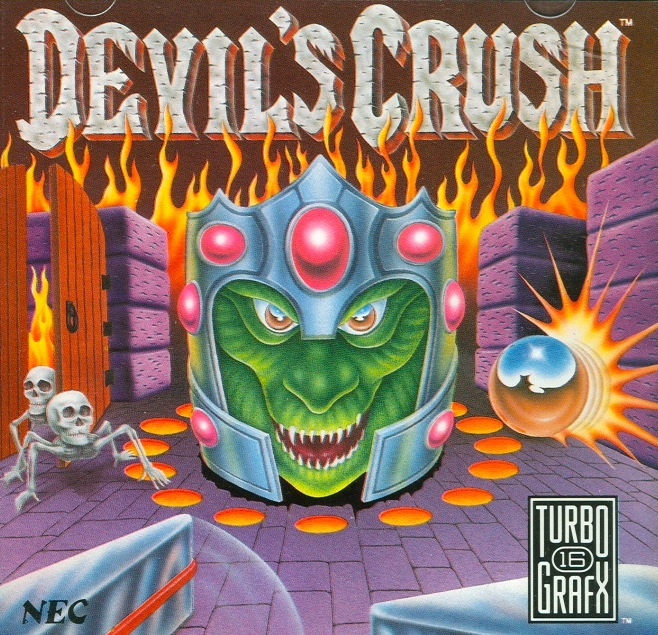 Alien Crush was released in North America in 1989 and Devil’s Crush was released in 1990, both for the NEC TurboGrafx-16 game system by Naxat / NEC. I owned and played both games on the TG-16 getting them as they were released respectively. I believe Alien Crush was one of the first games I owned for the TG-16, since it was one of the more outstanding games on the system at the time. Both games are very similar in game play and style, so I decided to combine my stories into one post. Being the games are a take on a pinball simulator, it stands to reason both games have a huge amount of replay value in them, which of course, they do! I used to sit around and play with friends, like Dustin or Brandon to see who could get the highest score on them. When the games were released on the Wii Virtual Console, I purchased both games and played them quite a bit on the Wii as well. I’ve played Alien Crush Returns on the WiiWare when it was released a couple years ago too. I was impressed how much fun the new version of the game was to play after all these years. They did a great job recreating the original style of gaming in a completely 3D environment and prospective. The board almost seems “alive” more so then the original 2D versions from the TG-16. There is apparently another Japanese-only “crush” game released in 1992 for the Super Famicom called Jaki Crush. The game looks very similar to both of the previous games but a different gaming board and new mini-games. Check out the YouTube video here or below. I’ll start with the first game in the series, Alien Crush. The Alien Crush game is modeled after the Alien series of movies, or at least that’s how it feels. 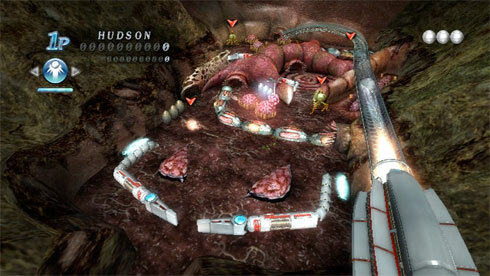 Alien Crush has the feeling that you’re playing on a living, breathing game field. The bumpers are alive, the flippers are alive, the board is covered with living creatures which move, scream or die when you hit the ball into them. There’s a brain-like thing in the top section of the screen which opens up when you hit it so many times and Alien-like face huggers come out, which you can hit with your ball and kill for extra points. And that’s what this game is all about, high points. Always good stuff, and highly re-playable. The Devil’s Crush game was the follow up game released about a year later. The game improved upon some of the short falls of the first game (which I’ll talk about next). The second game took a slightly different design and went with a longer gaming field. It’s really three sections to play on now, where Alien Crush had only two screens. Devil’s Crush also added the scrolling ability for the game. The screen now moves and tracks with the ball as it moves around the game field. There are skulls and dragon at the bottom screen, a creepy looking woman’s face in the middle, and a Satanic ritual looking group at the very top of the screen. I think one of the best parts of the Devil’s Crush game is the ladies’ face in the middle of the screen. As you hit her with the ball, she starts to change and finally she transforms into a reptile-like face and presents the opportunity for a mini-game. Devil’s Crush also had a huge amount of re-playability and once I got this game, I didn’t really play Alien Crush as much, mainly because of the new-ness, but also the improvements in the game just pushed it ahead of Alien Crush IMHO. The game has another interesting feature, which you could only find in a virtual pinball game like these, bonus game. There were some areas of the screen where once you achieved a certain move or score, a path would open up allowing you access a bonus game for more points. The game consisted of games like destroying all the enemies on the screen to changing all the bumpers to a certain color. The good news was when you drained out the bottom, you’d be returned to the main screen to continue playing your game. I used to really like the bonus games since it was a change of pace from the main game. One of the things about Devil’s Crush which really stood out for me was the scrolling play field. 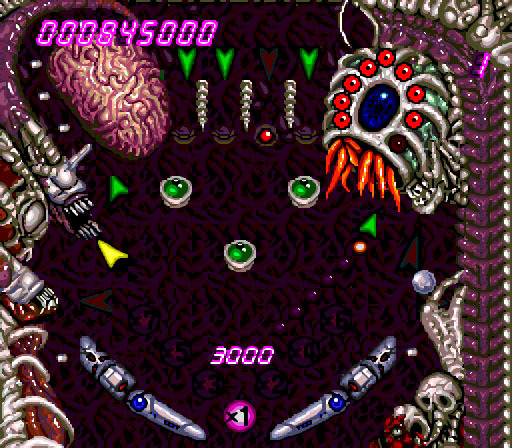 In the original Alien Crush, you had two playing fields, but the screen would snap back and forth as the ball moved from top to bottom of the screen. If the ball were to get caught in the area between the top and bottom of the screen it would get disorienting because of the flashing between screens. Devils Crush completely did away with that issue because now as the ball moved up and down the playing fields, the screen moved with it. Very nice! There two different musical scores for Alien Crush game which allows you pick what you listen to while you play the game, while Devil’s Crush doesn’t have that feature. It still seems like an odd feature really when you think about it. This is kinda of a small thing which I remembered. In Devil’s Crush when you’re playing, there’s a skull in profile where you can see one eye ball. It’s interesting because the eye ball actually watches and tracks with your ball as you move around the screen, specifically on the lower portion of the screen because that’s where the skull is located, but it’s a nice touch to the game. Also when you die, the skull will chuckles at your loss.